Verdi’s Aïda premiered in Cairo in 1871. It was an instant sensation and has remained a mainstay of opera all over the world. That said, we’ve all seen enough wobbly-pyramided versions of Aïda; isn’t it time this old warhorse of an opera gets a makeover? With neo-punk, pink-haired designer Zandra Rhodes at the helm, you just might not recognize Egypt. Since we really can’t be sure what kind of décor these ancient people preferred, and Napoleon and his gang plundered the ruins, why not have a little fun? 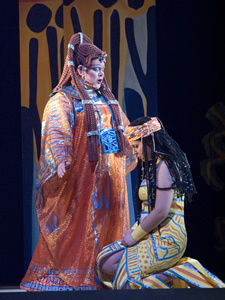 The Houston Grand Opera production of Aida pulled out all the stops. Rhodes creates an Egypt more of our dreams than of fact, and that’s where the spectacle begins. Sliding panels on 45 degree angles (so as to get as my triangles going as possible) make for a magical landscape. Rhodes’ love affair with triangles makes perfect sense for a story that is essentially about a love triangle. There’s not a broken-nosed sphinx in sight; in fact the palette of orange, gold, turquoise, and midnight blues gives a freshly painted look. Nothing looks like stone; in fact, the sets have a crayon-drawn-on paper look. It’s fanciful, fresh, exotic, and gives Aïda a welcome update. Everything is also remarkable flat, which is a curious choice when you think about ancient Egyptian art; they knew well about perspective but chose to depict their images in 2-dimentions. This 2-D approach makes the singers pop out and look nearly surreal. Fabulously pleated skirts and capes add to their otherworldly presence. The costumes are simply divine. This is haut couture Egypt. HGO’s production features an international cast of superb artists. Zvetelina Vassileva makes a proud and potent Aïda. Italian tenor Marco Berti portrays Radames with vigor and depth. Vassileva and Berti are especially captivating in the final scene as their world begins to fold in on them. The sliding panels work so well in creating a feeling of descending and disappearing. Dolora Zajick domineers as Amneris, the other woman who in the end finds it in her heart to forgive the forsaken lovers. American baritone Gordon Hawkins strikes a powerful presence as Amorasro, Aida’s father. Jo Davies’ deft direction plays with contrasts between the extremely active sets and costumes and the stoic feel of the acting and blocking. Jonathan Lunn’s intricate choreography brought a needed dose of three dimensional movements and added to the exotic flavor. Houston dancers should be commended for their fine performance. The elephant puppet, apparently operated by no less than 11 people, proved spectacular and elevated the famous Triumphal March into something quote breathtaking. Chris Davey’s lighting design baths the opera in a fiery glow. The HGO orchestra and chorus, under the baton of Carlo Rizzi making his HGO debut, stayed true to Verdi’s heroic music.